We here at Idaho Jewels have come to believe SO strongly in Life's Abundance, that we have chosen to include it in our health guarantee. We feel very strongly about keeping your puppy as healthy as possible and we feel that providing this premium, holistically formulated dog food it will ensure your dog’s nutritional health and long-life! So many dogs and cats are acquiring serious life-threatening health risks through poor diet and vitamin deficiency. Life's Abundance provides the optimum nutritional benefits for all life-stages ensuring good health and longevity for your Idaho Jewels puppy, which is why we are willing to stand behind our health guarantee when you feed this specific line of holistically-formulated dog food only! We are often asked, “What should I feed my puppy? What do you recommend?” We have always researched the dog food and looked at the first few ingredients and the guaranteed analysis. When we first started out, we began feeding Eukanuba and then throughout the years we have also used Kirkland's Nutra Nuggets, Pure Balance, Royal Canin, NutriSource, Wellness, Nutro, Fromm, Taste of The Wild, Merrick, Victor, TLC, and American Journey. We have ALWAYS come back to Life's Abundance though because we end up feeding 2-3 times as much of these other brands and do you know what happens when you feed more? Yep! They POOP more! And, it does end up costing a lot more too! Click HERE to go compare YOUR dog food! Do you remember the big dog food recalls in 2007? That's when we initially became concerned about keeping up with the news. While researching, we were disgusted with the fact that too often the commercial brands were outsourcing and cheapening their ingredients (especially the types of protein) to increase the bottom line. We have to worry about fillers, GMO’s, and animal by-products. And then of course there are new recalls and reports of contamination on an almost daily basis now.....most recently a plethora of recalls for feed containing pentobarbital...if you don't know what that's for...you should! It's the drug used for euthanizing pets! How'd that get in there?....You seriously don't want to know!! And, now there are a few class action lawsuits against big name companies (Blue Buffalo, Science Diet) for flat out lying to consumers about ingredients. It's truly shameful and can leave even someone who knows about canine nutrition to feel utterly duped! 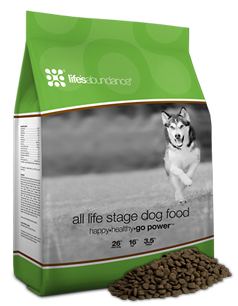 Then in March of 2012, we were introduced to Life's Abundance, a premium holistically-formulated dog food for ALL life stages not sold in stores, delivered directly to customer's homes making it more nutritious and super fresh! In January, 2017, Reino & I took the time to go to the home office in Jupiter, Florida to personally see and meet the facilities and meet the CEO, the formulator and the friendly staff! 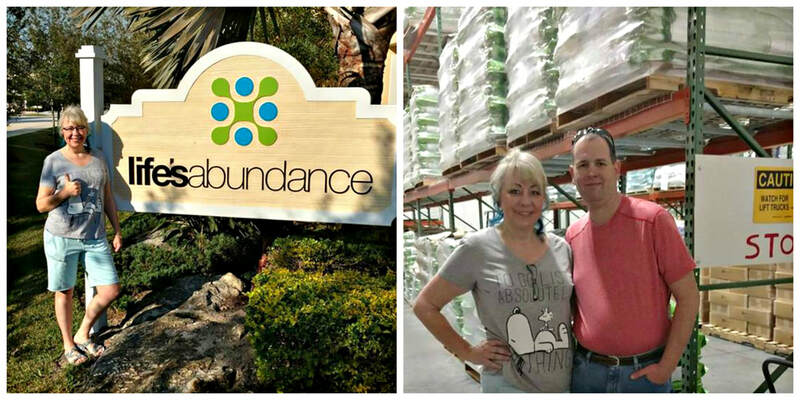 We were so impressed by the quality and high standards of this dog food and the amazing testimonials from the customers and field representatives of this company that we decided to make the switch to Life's Abundance. It is one of our goals at Idaho Jewels to not only improve the quality of our dogs, but to also offer our customers beautiful, healthy, and sweet-tempered puppies that they can enjoy for many years to come. Life's Abundance contains NO by-products, NO corn, wheat, NO soy, NO artificial colors/flavors, NO artificial preservatives. Feeding this healthy food will help give your pet a long and healthy life! And if that isn't enough, it costs LESS per serving than other premium dog foods & will be shipped right to your door! We love it and more importantly, our DOGS all love it! Life's Abundance also contains important GUARANTEED LIVE probiotics and prebiotics that aid in your dog’s overall gut health and digestion. These key ingredients, including several other needed vitamins, also support your dog’s overall immune system. We’ve been privileged to personally speak with the company President and CEO, and most importantly, its formulator, Dr. Jane Bicks, DVM, and continue to have direct access to them to ask them questions. Who is Dr. Jane Bicks, DVM? She has been a holistic vet for over 20 years. She has served as President of the American Veterinarian Association of New York City, earned three Presidential Citations, appointed by Mayor Rudolph Guliano to help establish one of the largest animal shelters in the world, the author of three books on responsible care and treatment of pets, and has appeared on 48 Hours, Good Morning America, CNN, Discovery Channel, Animal Planet, and more. She has also created a non-profit foundation where a percent of her product line is contributed toward rescue and care for pets. There has NEVER been a recall of this holistically formulated food and it is produced in limited runs on a weekly basis, minimizing periods of storage and helping to deliver the freshest-possible product. While leading brands stockpile tons of food for months on end, Life's Abundance is made weekly in small batches. Fresher food is more nutrient-rich! You can be assured that your new Idaho Jewels puppy will benefit from their strict inventory controls and product safety considerations that are second-to-none. ​This is why Life's Abundance cannot be found at your local store! ﻿Why has Life's Abundance never been recalled? Why is it NOT readily available on the store shelves? While this dog food might “seem” more expensive up front, the cost is about $1.88 a day for a 70 pound adult dog!! Americans spend more than that on their Starbuck's coffee every morning!!! Higher calories per cup means you'll feed LESS dog food, but they receive MORE nutrition! They are able to digest and utilize the dog food more efficiently due to the special cooking process. Plus, you are ensuring a long and healthy life for your fur-baby when you feed them quality nutrition! ​Isn't your precious Idaho Jewels puppy worth it? Day 1-2: Feed ¼ Life’s Abundance and ¾ of the old diet. Day 3-4: Feed ½ Life’s Abundance and ½ of the old diet. Day 5-6: Feed ¾ Life’s Abundance and ¼ of the old diet. Day 7: The transition period is over and you can feed the recommended amount of Life’s Abundance. Life's Abundance has an unprecedented breeder program available too! ​At Idaho Jewels we are primarily focused on the health and well-being of our own dogs and the puppies we produce for our loving families; however, we love helping other breeders and pet professionals to produce better, healthier puppies & kitties, all while saving money and being rewarded for their recommendations too! Learn more by clicking below or contact us!